The 1 selling Darts Scorer! Play real darts. Keep score with Dart Meister! Watch the trailer video at Dart Meister takes the hassle out of scoring darts and helps beginners learn to play! The innovative input system is a joy to use. 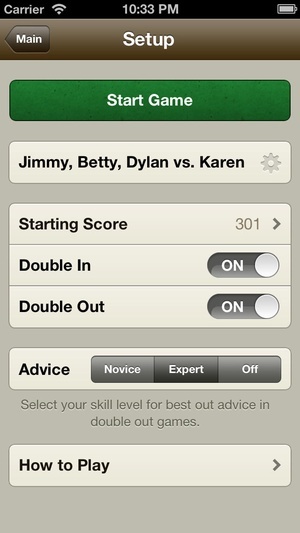 Just tap in your throws on the Dart Keyboard and Dart Meister calculates the score for you. Tap a number to score a single. Tap and drag toward the center to score a double or triple. Beginners will appreciate that misses don't need to be entered ) Dart Meister only allows valid throws to be entered. Not only does this help beginners learn the game (and yes, game rules are also provided), but it helps prevent errors. But if you do make a mistake, simply tap on a throw to remove it (much easier than the unwieldy undo system in other apps). This even works for past rounds in the history view! No other dart scorer can do this. 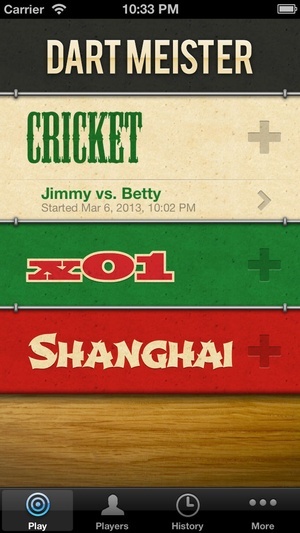 Score Cricket, x01 & Shanghai with up to 4 players or teams. Feature Highlights Score Cricket, x01 & Shanghai Up to 4 players or teams Numerous game options Best throw entry system available Highlight where to throw and score Visualize throws & calculations Novice or expert out advice (x01) Game stats (points per round. etc.) Spacious full screen scoreboard Game rules & app tutorial Saved games, players and teams Cricket Options Standard, cutthroat or no points x01 Options Starting score 101 to 5001 Double in or straight in Double out or straight out Novice or expert check out advice Shanghai Options Starting number 1 to 20 Number of rounds 1 to 21 Double or triple out This section addresses comments and questions from the reviews 1 The app does not have a "miss" button, making the statistics inaccurate. The statistics are indeed accurate. After each round, Dart Meister automatically assumes the correct number of misses based on how many throws were entered. For example, if two throws are entered, Dart Meister assumes 1 miss. It works this way to reduce the amount of input required. 2 The app is split into two screens. It should all be one screen. Dart Meister features a spacious, easytoread scoreboard and the best throw entry system. Attempting to combine all of this onto one screen would require unacceptable compromises. Feedback on the two screen system has been overwhelmingly positive and it only takes a swipe of the thumb to navigate between them. 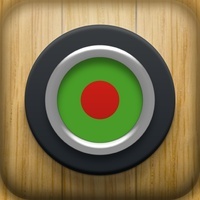 Check these links to find your download for Dart Meister for & iOS or for your device iPod TouchiPhoneiPad. 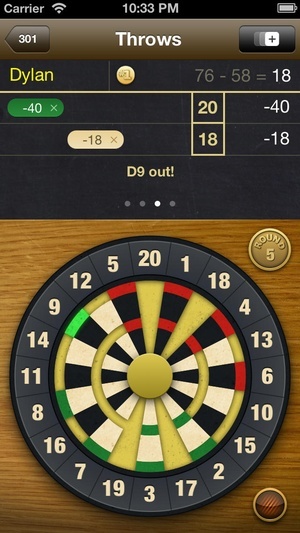 The app Dart Meister is compatible with te following devices.